Wall Street legend JP Morgan Chase and US retail bank Bank One have announced plans to join forces. The deal, which requires regulatory approval, would be the biggest financial sector merger in five years. Worth some $60bn, the transaction would consolidate JP Morgan's position as the world's second biggest bank after Citigroup, owner of Smith Barney. 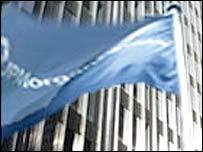 JP Morgan chief executive and chairman William Harrison would retain the same roles at the combined firm. Bank One chief executive James Dimon would become president and chief operating officer, and would succeed Mr Harrison as chief executive in 2006. The tie-up would give JP Morgan a foothold in retail banking, reducing its dependence on volatile equity markets and investment banking services. Bank One, with assets of about $290bn, currently ranks as the sixth biggest bank in the US. On Wall Street, Bank One shares surged by 10% in after-hours trade, while JP Morgan fell more than 4%. According to press reports, the deal would be completed through a share swap, with Bank One investors exchanging each one of their shares for 1.3 shares in JP Morgan. "It's a huge deal that's going to create a lot of rumours in bank land tomorrow," said Mark Fitzgibbon, banking analyst at Sandler O'Neill & Partners. The JP Morgan - Bank One tie up comes three months after Bank of America and FleetBoston Financial announced their own merger. That transaction, which is still awaiting regulatory approval, looks set to create the biggest consumer bank in the US.